The Bold and the Beautiful spoilers indicate that Bill Spencer [Don Diamont] might be reconnecting with yet another ex from his past. Just recently, he got pretty up close and personal with Brooke Logan [Katherine Kelly Lang] and now it looks like he and Katie Spencer [Heather Tom] might be working things out, despite their differences and their nasty court battle over their son. Plus, Bold and the Beautiful spoilers tease Taylor [Hunter Tylo] might be in trouble, Liam vows to be there for everyone he cares about and Steffy makes a huge decision. Here’s what you need to know. It all begins when Taylor meets someone from Reese’s past. She might be totally smitten with his new love in her life, but she’s about to find out a lot of things about him, some that will have her on high alert. 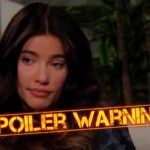 Elsewhere, Bold and the Beautiful spoilers indicate Liam vows to always be there for Steffy Forrester [Jacqueline MacInnes Wood] and Kelly, despite everything that has just happened between him and Hope. And while he doesn’t want his family with Steffy to fall apart, it looks like his marriage to Hope Logan [Annika Noelle] might be slowly but surely crumbling away. Meanwhile, Steffy agrees to make a decision that will impact everyone and their future together. She doesn’t want to get in the way of Hope and Liam’s relationship, despite their current circumstances. Wyatt and Hope will take a walk down memory lane to much better times, needless to say. Also, Thorne can’t help but feel pretty left out when he watches Will and his parents together by the Friday, January 18th episode. Could this mean that Bill and Katie are willing to set aside their grievances for one another in order to make their family work? Or have they finally realized that there’s still some feelings left over from their relationship? Fans will find out soon enough! In the meantime, don’t forget to check back with Soap Opera Spy for all the latest news and updates on The Bold and the Beautiful right here!